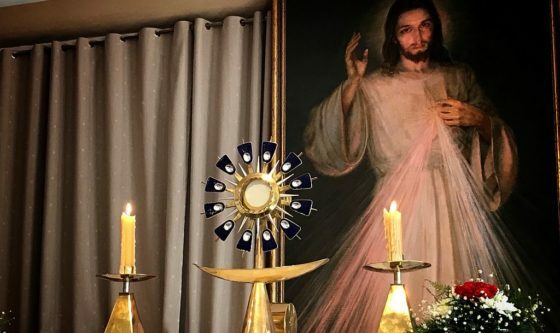 Evening with Merciful Jesus in Washington, D.C.
On January 22th, at the John Paul II National Shrine in Washington, D.C., Sisters from the Washington community of the Congregation of Our Lady of Mercy will host another Evening with Merciful Jesus. The meeting will start at 7.00 pm with presentation of the Blessed Sacrament, followed by Adoration and veneration of Merciful Jesus. A presentation on the Eucharist in the life and teaching of St. Faustina and St. John Paul II will be delivered by Sr. Gaudia Skass who announces: This great mystery of our faith was at the center of the lives of both of these great Polish saints. We can learn a lot from them. It will be a joy to share this treasure with young people in the USA! At the end, the young participants will meet over tea. “Evenings with Merciful Jesus” are organized for young people who want to follow in the footsteps of St. Faustina and St. John Paul II to discover a new quality of life in friendship with Merciful Jesus.